When the U.S. Supreme Court held the Professional and Amateur Sports Protection Act (PASPA) unconstitutional in May 2018, it left the decision whether or not to regulate and tax sports betting up to each state. In Washington state, there are several stakeholders in the debate over potential regulations, ranging from behavioral health advocates to Washington’s tribes. Another eyes the impending, burgeoning industry with what seems to be a complex combination of worry and hope: horse racing. Doug Moore, the Executive Secretary of the Washington Horse Racing Commission (WHRC), represented the WHRC at the Washington State House Commerce & Gaming Committee work session last week. 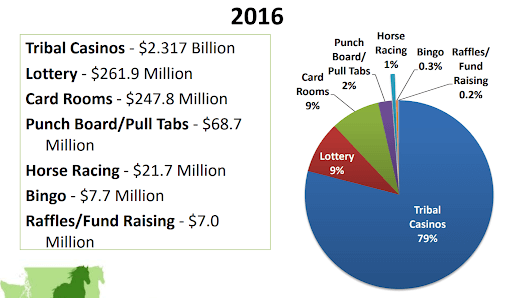 Moore showed that the horse-racing industry in Washington has experienced a steep decline in recent years as other forms of gambling have been introduced — with the most significant impact hitting after the first tribal casino opened in 1991. 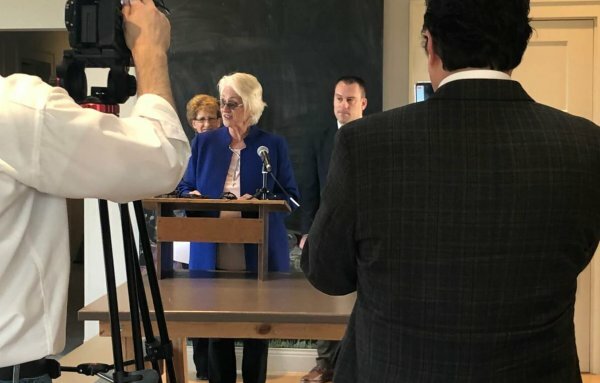 If yet another gambling industry is introduced to the state without consideration for horse racing, Moore said, the industry is in danger of disappearing from Washington completely. 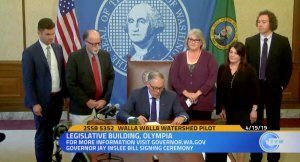 “While the WHRC is neutral as to whether Washington state should or should not authorize sports betting, what we do believe is that, if it is introduced and approved and horse racing isn’t given real consideration as part of sports betting — which is being done in other states — there’s a real possibility that this industry with a long-standing history in this state could disappear in a very short time, costing the state significant revenue and job losses.” Moore said to the Committee. In order to keep the horse-racing industry afloat, Moore urged legislators to consider it while writing sports-betting legislation. In a follow-up phone call, he told us that means horse racing should receive some of the future sports-betting industry’s revenue — something he said is being done in all other states with both legal sports betting and horse racing. The horse-racing industry, Moore said, is unique because it supports industries other than gaming and touches both eastern and western Washington. “This is also an agricultural industry, as well, that includes breeding farms, training centers, employees to care for the horses, the farmers that provide hay and oats, horse shoers, veterinarians, and many other connected jobs,” Moore said in his presentation. 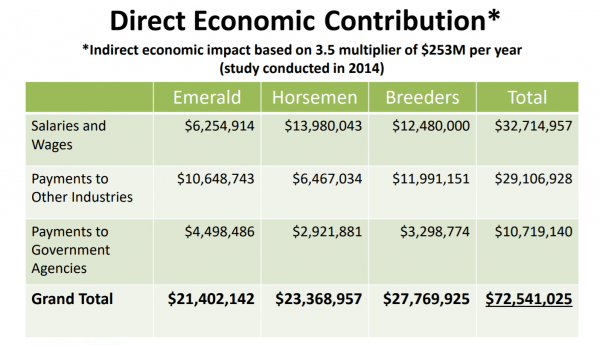 A 2014 economic impact study by Northwest Racing Associates, which once operated Emerald Downs, estimated the direct economic impact of the industry at more than $72 million. Indirect impacts, Moore said in his presentation, amounted to over $253 million per year. If horse racing were to be included in sports betting, he said, they would also hope to have a live sports book — betting on-site — at Auburn’s Emerald Downs. How much revenue, exactly, might the sports-betting industry bring to Washington state? 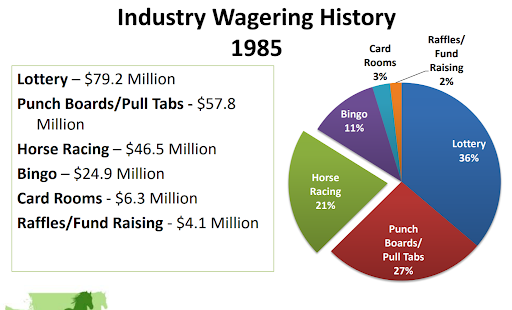 The Washington State Gambling Commission’s best guess references numbers from Eilers and Krejcik, LLC, a gaming-industry research and consulting firm that predicted gross revenue — in a fully mature market — in Washington. Brian Considine, Legal and Legislative Manager for the Washington State Gambling Commission, said he thinks those numbers may be overly optimistic. Part of the confusion around sports-betting revenue, he said, is oft-shared, misleading numbers in the “billions,” which refer to the total money collected from bets taken. Actual revenue, Considine said, is only 3 to 5 percent of that total amount. “It is a very low-margin business, historically, though they’re seeing some growth with mobile and internet wagering,” Considine said.